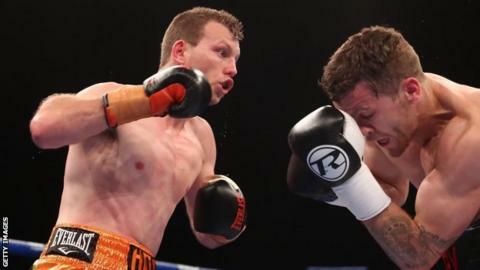 Jeff Horn has successfully defended his WBO welterweight title against Britain's Gary Corcoran. The 29-year-old Australian, a former schoolteacher who turned professional in 2013, won the title with a shock victory over Manny Pacquiao in July. Corcoran, 27, was bleeding from a cut above his eye when the bout in Brisbane was stopped in the 11th round. Horn now has 18 wins and one draw from 19 professional fights, while Corcoran has 17 wins and two defeats. Horn could next face American light-welterweight Terence Crawford, who in August to become the first undisputed men's four-belt world champion since 2005 as he added the WBA and IBF titles to his WBC and WBO belts. "It's a big possibility. If that is what everyone wants to see, I guess that is what is going to happen," Horn said. Britain's former world light-welterweight champion Amir Khan is another possible opponent - and the the 31-year-old was ringside in Australia. Khan last fought in May 2016 when he jumped weight divisions to face Mexico's Saul Alvarez for the WBC middleweight title, but was knocked out in the sixth round. Former eight-weight world champion Pacquiao pulled out of a November rematch with Horn in September. Now a senator of the Philippines, the 38-year-old Pacquiao announced he planned to quit boxing last year to pursue his political ambitions, but had initially wanted the rematch.